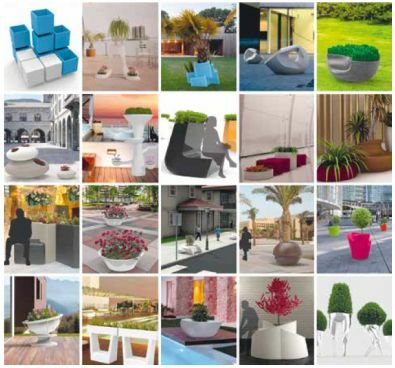 In November 2016, Nuova Pasquini e Bini, in collaboration with the Design Campus of the University of Florence, started a workshop with a selected group of students for the design of “new pots for urban furnishing”. Among the initial intentions of the company there was the will to select and award the best works followed by the realization of the molds and pots production. In fact, some creations were considered more interesting and the students that realized them were awarded, but since all the designs presented were good, we decided it was right to give a “chance” to all the young designers participating in the workshop and directly ask the opinion of the green area operators, especially landscape architects and nurserymen that take care of urban furnishing and public green areas, to understand which pots could be more innovative and useful in this sector. We kindly ask you to communicate your opinion through the following questionnaire: your collaboration is important and will allow us to supply the best products. 1. Which design did you like most ? 2. In your opinion, are modifications necessary to improve the design? 4. If one of the products (indicate which) were already available on the market would you buy it or recommend one of your collaborators/clients to purchase it? In case of negative answer or unlikely to the previous question, please state the reasons. ---On the market there is no need for this type of productSimilar products (also realized in other materials) or the other design solutions (not pots) currently on the market are sufficientThe product is not easy to be usedThis type of product would cost too much for the contexts in which it could be used.